I know this is a last minute project; but, the basket can be made for other times of the year like Mother’s Day. 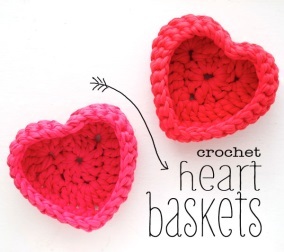 Start by making the base heart shape. 1. Work all your dc stitches into here – last stitch of chain. 2. The stitch will get really big, you can tighten it later. 3. To finish first round, slip stitch into here. 5. Treble stitches all go here. Hint: Treble Crochet is similar to double crochet but yarn over twice in the first step. 6. You have the first bump on your heart. 7. Work your dc to create half your heart. Making the tip of the heart. I found this bit a bit tricky, I hope it’s clear with the photos. B. Chain one then insert hook here. 10. To close heart shape slip stitch into here. 11. Your base is complete. 12. Chain one then sc (single crochet into every stitch) to start building up sides of basket. Top tip: Make different shaped baskets by using different shaped bases. Square, round, oval or hexi all work great, just sc with no increases and the wall of your baskets will start to build up. To make the sides of this basket you will need 3 rounds of sc. Any more and you start to lose the heart shape. 13 & 14. This is the first round of sc, see how the sides are starting to curve up. 15. After 3 rounds of sc. 16. Slip stitch and weave in end.